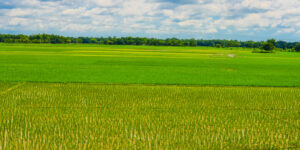 The North Eastern parts of the country are some of the least explored parts of India. It was my dream to embark on a road trip from Delhi to my home state Assam via Nepal. But the closest I could come to that plan was to complete the route planning with the Chief – HV Kumar back in 2013. After years of anticipation, finally, a window of opportunity appeared in July 2018 to embark on the long due trip. I was trying to cut down; keep my travelling simple. There were no long drawn preparations for this trip. Sometimes things which are not meticulously planned brings the nicest surprise! So all I did was get my Enfield Thunderbird serviced and changed the rear tyre to a grippy Ralco, thus avoiding unnecessary hassles of frequent punctures. 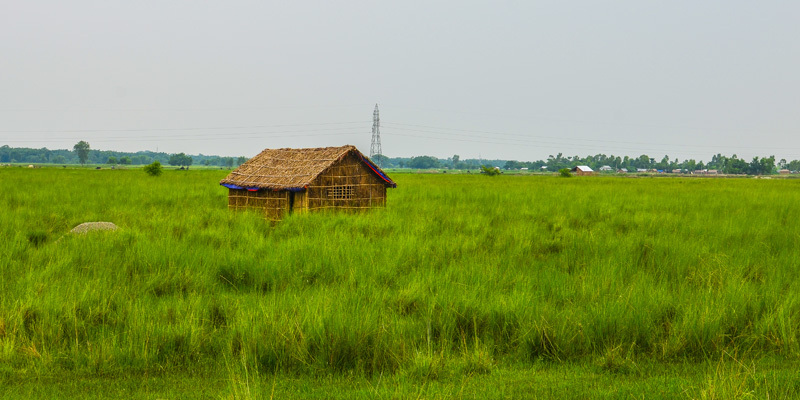 Day 4: Alipurduar – Jorhat: 605 kms. Sticking to the plan, 5th July saw me waking up early to pack my two trekking bags with clothes, blanket, tent/sleeping bag, medicine, toiletry items, engine oil/ bike-spares and food items for the trip. By 8 in the morning, I beat a lazy retreat from Delhi knowing that I needed to cover only 400 kms in the entire day. I kept the first day relaxed since it would involve border crossing formalities into Nepal. 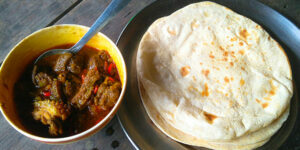 By 10AM, I had crossed Gajraula and halted for some delicious Chicken Korma and roti by a roadside dhaba. The highway was clear thereon. Wherever I halted, people didn’t fail to register their surprise at my plan of riding to Assam via Nepal on a bike. Many, without a fail proclaimed that only an Enfield can make such long distance riding of 2500 kms possible. I kept a straight face while explaining that it’s achievable on any bike. What matters is the riding endurance and passion of the rider. So, more of a rider thing than a machine thing. The weather was hot and humid, but on the highways you don’t feel the heat. Taking time to pace myself, I crossed Hapur and Gajraula (UP) in the first one-and-half and two hours respectively. The roads freed up once the Pilkhuwa-Hapur stretch was crossed. 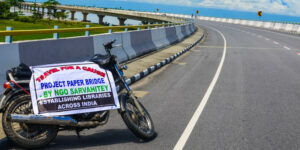 Thereon, it was a straight run on the Moradabad Bypass-Rampur expressway. The road deteriorated after Rampur and was an absolute sandy mess in Bilaspur. The sturdy Enfield took everything in its stride. We cantered on to reach Rudrapur in Uttarakhand, a border city near Haldwani by 2PM with the odometer reading 240 kms. 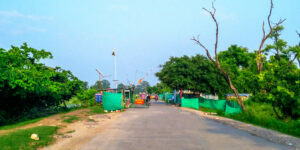 From Rudrapur chowk (roundabout), one has to take the right towards Banbasa, the border state on the Indian side of the border. Roads were again a breeze after Rudrapur and we covered 40 kms in the next half hour to reach Sitarganj at 3PM. Banbasa was only about 40 kms away, so I took a quarter hour power nap at a temple in Nanakmatta after crossing Sitarganj. Once the ride resumed, it took about 15 odd minutes to reach Khatima. Google maps confused the road passing through the town towards Banbasa, and I ended up taking help from locals to reach Banbasa by 5PM. The train-gate was down by the time I tried crossing Banbasa, and I ended up waiting and interacting with the locals while having some tasty golgappas. Watching the train sail by, I couldn’t help but wonder how conveniently anyone can travel to this border state by train. 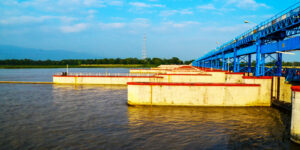 I crossed over the Sharda Barrage which is fed by the Karneli River. The barrage entry gates are not kept opened throughout the day, but only for a couple of hours like 9-11AM, 1-3PM and 6-7PM which brought about border traffic movement. However, two wheelers can easily pass through the smaller side gate. Once the barrage is crossed, one comes across the last Indian checkpoint manned by the Border Police (BSF). Here, both exiters and entrants are thoroughly checked. One jawan checks your bike while others check your belongings and identity/ bike papers. They were definitely nosey about my tent and portable stove/ butane canisters. 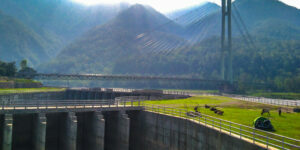 Once all questions were answered to their assurance, they let me proceed to the Nepal side. 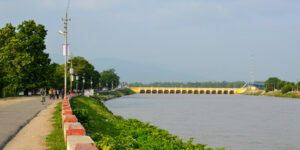 Karneli river flowing through the barrage. The Nepal side was definitely a lot cooler than the Indian side. No one checked my bags, although armed guards kept an eye on all entrants. I got warned by a young Nepalese police office when he observed me carrying the helmet on my hand while clicking pics from the bike. He sternly requested me to put it back on as Nepal observes strict traffic rules and that he wouldn’t like to fine a visitor from India. Apologizing, I asked him for directions as to where the bhansad (daily permit) could be made and he pointed me towards a Customs Department building, a couple of 100 metres away. As the sun was bidding adieu, I hurriedly proceeded to the Customs Office in Gaddachauki, so that I could move on to Mahendranagar (Bhimdatta) which is about 5 kms from the border. The bhansad issuance process didn’t take much time and I was done by 6:45PM. The officer required only the RC (Registration Certificate) of my bike. I got a pass issued for about 4 days which cost me about INR 300. They handed back the change to me in Nepalese currency, the conversion rate being INR 100 = 160 Nepalese. I noticed that their clock was running ahead of mine by 15 minutes, thereby signifying that I have entered a different time-zone. It was 7PM as I continued towards Mahendranagar. The sun hasn’t set yet, and I decided to keep continuing and cover as much distance as possible, as this will help me rationalise the next day’s riding distance. The beauty of the East-West Highway of Nepal is that it’s a straight and non-confusing. This terai belt extending to over 1000+ kms connects Bhimdatta municipality in the West to Mechinagar in the East. It’s a single lane highway, yet the traffic was unlike anything in India, disciplined, sparse and everyone riding with helmets on. The small settlements and townships I kept crossing on the way mirrored an aura of rural Indian villages, esp. Central India. Riding at a brisk pace of 65 kmph on the smooth single-lane road, I crossed Kanchanpur/ Daijee (350 kms on the odo) soon, and reached a decently large town called Attariya by 7:50PM. I had by then covered about 60 kms of the Nepalese territory. Seeing a few hotels and fast food joints, I thought of making a pit stop for the night at Attariya. A plate of warm and delicious chicken rice coupled with a cold drink cost me only INR 50. I was loving the exchange rate! I asked around with the shopkeepers if it was a safe place to camp. They replied in the affirmative. A friendly hotelier came up and asked me, “Brother, what if I directed you to a better place to camp?” I was all ears. He talked about a nearby place called Chisapani, a place frequented by tourists, and featuring a huge bridge by the riverside. 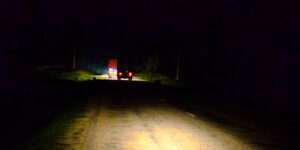 Night ride towards Chisapani with trucks for company. A cool breeze blew in the night. Only about 90 kms from Attariya, it would take about an hour and half to reach. Camping near a bridge by the riverside with a cool breeze for company sounded exciting, and I was on the way to Chisapani by 8PM. 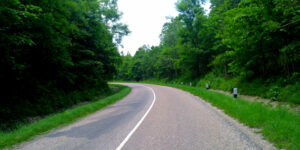 The road was good with next to nil traffic, with truckers giving me company. Reaching Chisapani a bit after 9:30PM and after taking in the ambience of the place, I took the downroad from the bridge towards the river and put up tent by the enclosed reservoir ground. The night was peaceful, but I had underestimated the terai heat. My tent was graded -5 to 10°c and it traps heat very effectively. I ended keeping the top flap open in order to let the heat escape. Waking up at 8 in the morning, I was hailed by a local youngster who came down to the reservoir ground to check if some foreigners were camping. Sameer Saud, the hospitable youngster took me around his village and the famous Rock Garden of Chisapani by the banks of the Karneli River. Camping by the reservoir grounds overlooking the river. Treating me to a delicious breakfast of chapati-porcupine meat soup at his uncle’s eatery, Sameer narrated how he had spent his childhood schooling days in Chandni Chowk, Delhi, his infatuation with football, teaching football to the local kids and setting up his own cafe in Chisapani. His hospitality went to such an extent that I could depart from Chisapani only by 12 in the noon. Brunch featuring tasty porcupine meat. A smiling Sameer with his uncle at their eatery. The beauty of the traversing the East-West Corridor of Nepal is the number of National Parks you cross on the way. 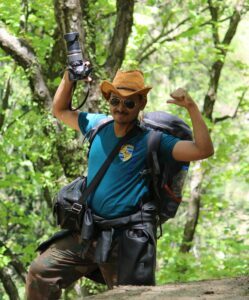 I had traversed the Shuklaphanta National Park the previous day near Bhimdatta. 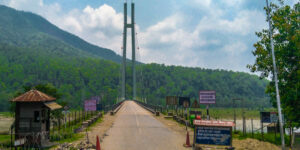 Upon crossing the Chisapani bridge, I entered the Bardiya National Park which paved way to the Banke National Park in another 2 hours and 100 kilometres later. 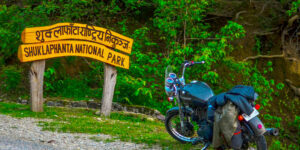 I encountered the first entry check-post at the Banke National Park wherein my bhansad and RC was checked. The cops were friendly and didn’t have much to ask. Taking an hour long break at Banke, I proceeded to Lamhi (670 kms on the odo) from where Butwal was about 110 kms. Thankfully, the terai heat soon gave way to a drizzle and taking breaks by petrol pumps, I reached Butwal at 8PM. It was the first major town I came upon since I crossed the border and was at par with our metro cities. The flexible usage of Indian currency throughout this stretch amazed me as I continued towards my ultimate pitstop for the day – Hetauda, about 200 kms from Butwal. After taking a break at Danda for dinner at 10PM, I kept on riding in the night to cross Narayangarh at 12:15 and Hetauda at 1:45 in the night to clock my first 1000 kms of the trip. The following morning, I resumed riding by 9. An inadvertent delay was caused due to me missing the left turn from Hetauda towards Kakarbhitta/ Siliguri. 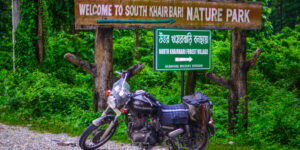 There were no more confusion thereafter as I crossed Bandipur (12:30PM), Itahari (3:30PM) and Damak (4:20PM) to reach the border town of Kakaribhitta/ Mechinagar by 5:45 in the evening. At Kakaribhitta, I tanked up my bike with the cheap petrol (INR 63 versus INR 80 in Delhi) and proceeded towards the Mechinagar bridge, crossing the 1500 kms mark on my bike odometer since the trip started. I was surprised that there were no security personnel to check me or my baggage as I crossed over to Naxalbari in West Bengal. 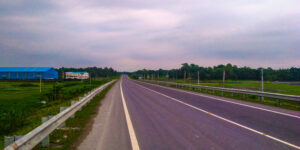 Entering India, I was welcomed by wide 4 lane highway that connects Naxalbari to Siliguri which is only 20 kms away. The rain played spoilsport and I had to break for nearly 2 hours before I could set off for Siliguri by 8:30PM. The target for the day was to reach Alipurduar which was about 150 kms from Siliguri, if I took the Belacoba- Jalpaiguri-Dhupguri route (NH27) rather than the generally avoided Birpara-Hasimara route. Accordingly, I reached Siliguri by quarter past 9. 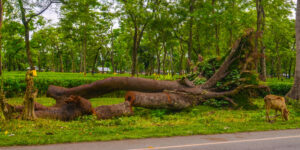 The road harbouring Fulbari was in shambles but once I took the left turn to Belacoba, the road turned pitch perfect and I reached Jalpaiguri by 11. However, my happiness didn’t last long with the road becoming a sandy quagmire soon thereafter. I battled towards Dhupguri via Maynaguri passing through hordes of slow moving line trucks covering me in sand. It took me nearly 2 hours to cross this 40 km section and by the time I reached Dhupguri outskirts, I was exhausted. I saw an abandoned shelter by the road. Parking my bike in the shelter, I sprawled on the ground on my mattress, sleeping soundly till 6 in the morning. 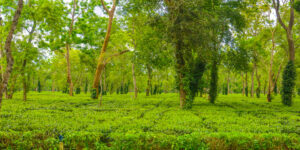 Beautiful tea gardens – the essence of Upper Assam. Upon resuming riding while trying to reach Srirampur border (Assam-WB border), I somehow ended on the Birpara route but nothing untoward happened. The Jaldapara Nature Park near Hasimara was the most scenic place I crossed in this route as I entered Assam. The road was a delight in this stretch and my sleep-rested mind rejoiced at the familiar essence of Assam as I reached Gossaingaon by 10AM. The recent rains had refreshed the air as I took in the smell of my native place. The fourth day of my trip saw me covering Gossaingaon to Tezpur, a stretch of 350 kms traversed from 12 in the noon to 6 in the evening via Bongaigaon – Pathsala – Rangia – Baihata Charali – Mangaldai with most of this stretch being perfect for riding. Day 3: Gorakhpur – Faizabad – Lucknow (280 kms) – Agra – Delhi (560 Kms). 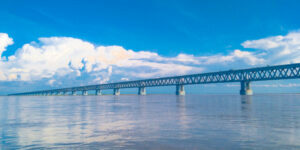 The under construction Bogibeel bridge connecting Dibrughar district to Dhemaji district. 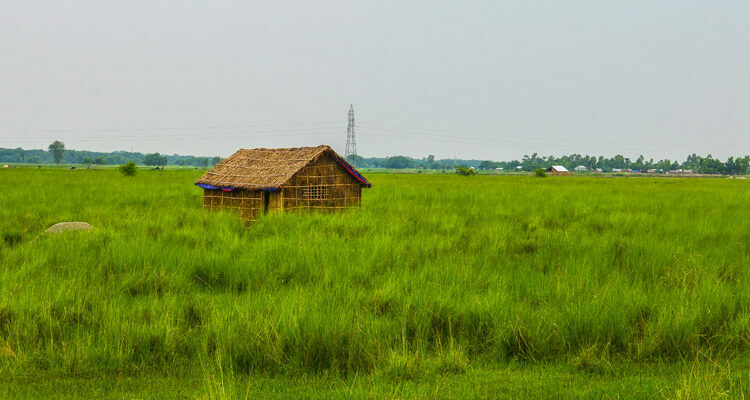 On the first day of the return trip to Delhi, I reached the Paschim Madati Toll from Siliguri and was at crossroads as to whether to take the Kishanganj-Purnea route to reach Darbhanga or the lesser known Khoribari-Bahadurganj-Araria route. I inquired with the truckers but they did not have much information about the Bahadurganj route. 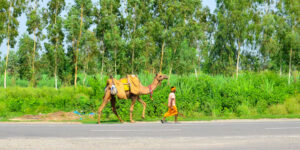 They frequented the Islampur-Purnea highway as its width facilitates the movement of wide-body trucks. After much dilly-dallying, I decided to head back to Ghoshpukur and take the Khoribari-Bahadurganj route as it is shorter by about 85 kms. Also, less information about this route made me all the more curious. Turned out to be a good decision as the route was mostly in great condition other than a few stretches near Bahadurganj and Jokihat/ Araria. I was stopped by both Bengal and Bihar Police but was allowed to proceed without any issue. 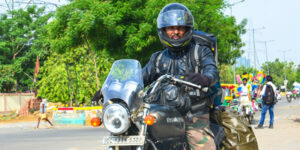 The last/ third day of the trip saw me riding 850 kms to reach Delhi from Gorakhpur in 15 hours. This was only possible due to the smooth 300 kms Agra-Lucknow Expressway and the 160 kms Yamuna Expressway (Agra-Delhi). Though I had to pay INR 300-400 as two-wheeler toll for the Agra-Lucknow Expressway, I didn’t repent it since it minimized travel time and resultantly, allowed me to reach Delhi the same day. What I found dismal about the Agra-Lucknow e-way was the absence of petrol pumps and rest houses in this 300+ kms long stretch. Only two convenience outlet sheltering petrol pumps were there in this entire stretch; the first after about 100 kms from Lucknow side and the other nearly at the exit. There was absolutely no shelter for users amidst these two and no patrolling parties. I wondered about the travails of drivers who got stuck in between with vehicle breakdown or fuel shortage issues. All’s well that ends well! Covering 7,500 kilometres while navigating from North to North East corner of the country, I reached back home safe and sound. 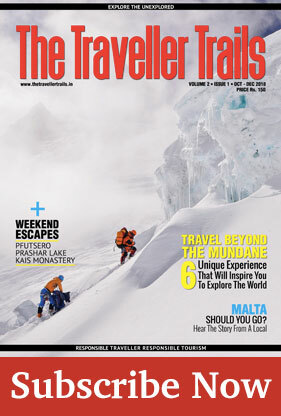 Two destinations in Arunachal (Menchuka and Tawang) were also covered, but that’s a story for the next edition. Till then, adios! Thank you so much for your appreciation, Tarsem ji.